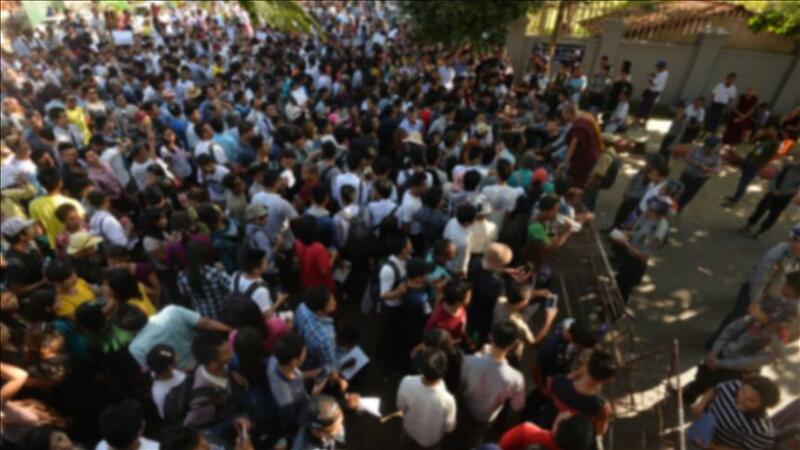 YANGON, Myanmar -- Hundreds of people marched Sunday in Myanmar’s commercial capital Yangon demanding that the government use a discriminatory term to refer to around one million stateless Rohingya Muslims in the country’s west. Most of the Myanmar public uses the term “Bengali” to describe the Muslim minority group in western Rakhine state -- who self-identify as Rohingya ethnic to the country -- suggesting they are illegal immigrants from neighboring Bangladesh. The government led by State Counselor Aung San Suu Kyi, however, has suggested to the United Nations and the international community that “Muslim community in Rakhine state” should be used instead of controversial terms “Bengali” or “Rohingya”. Several hundred people -- mostly supporters of Buddhist nationalist organization Ma Ba Tha -- took part in Sunday’s two-hour march in Yangon, demanding that the government readopt the term “Bengali” to refer to Rohingya -- described by the UN as among the world’s most persecuted minority groups. He insisted during the march that “Bengali” were not the only Muslims in Rakhine and that the new term “would create more confusion”. “That new term would not be accepted at all,” he asserted. Rakhine is home to other Muslim groups such as the Kaman who -- unlike the Rohingya -- are officially recognized as among Myanmar’s 135 ethnic groups. Around a hundred police had been deployed to stop the marchers near the Shwedagon pagoda, Myanmar’s most sacred Buddhist monument, but allowed them to proceed after an argument broke out between marchers and officers. Thuzar New, an employee at a local company, told Anadolu Agency that she joined the march even though she is not a supporter of Ma Ba Tha, the Burmese acronym for the Association for the Protection of Race and Religion. “I am not a racist. I am not an anti-Muslim. But I hate these Bengali Kalar,” she said, using a derogatory term for Muslims and Hindus in Myanmar that had originally been leveled against Indian migrants without any affiliation to Islam. “These Bengali Kalars would make Rakhine people disappear,” she added. Last week, thousands had participated in marches in Rakhine’s capital Sittwe and 17 other towns in the state as part of the campaign denouncing the government’s new term. The powerful Arakan National Party -- which won the majority of seats in Rakhine in last year’s general election -- described the new term as “totally unacceptable” last month. A statement insisted that such “illegal immigrants” had been listed under the category “Chittagonian” in censuses conducted during British colonial rule and under “Bengali” in censuses of 1973, 1983 and 2014. “This new term would efface the origin of these Bengalis, and fabricate that these people are Rakhine natives,” it said. Since her party's victory in the Nov. 8 election, Suu Kyi has been placed under tremendous international pressure to solve problems faced by Rohingya but has had to play a careful balancing act for fear of upsetting the country's nationalists, many of whom have accused Muslims of trying to eradicate the country's Buddhist traditions.